Mangroves Represent A Characteristic Littoral (Near The Sea Shore) Forest Ecosystem. These Are Mostly Low Lying Coasts, Estuaries, Mudflats Tidal Creeks Backwaters(Coastal Water Held Back On Land) Marshes And Lagoons Of Tropical And Subtropical Regions. Mangroves Grow Below The High Water Level Of Spring Tides. The Best Locations Are Where Abundant Silt Is Brought Down By Rivers Or On The Backshore Of Accreting Sandy Beaches. Mangroves Are Highly Productive Ecosystem And The Trees May Vary In Height From 8 To 20m.They Protect The Shoreline From The Effect Of Cyclones And Tsunamis. Since Mangroves Are Located Between The Land And Sea They Represent The Best Example Of Ecotone. Mangroves Are Shrubs Or Small Trees That Grow In Coastal Saline Or Brackish Water. 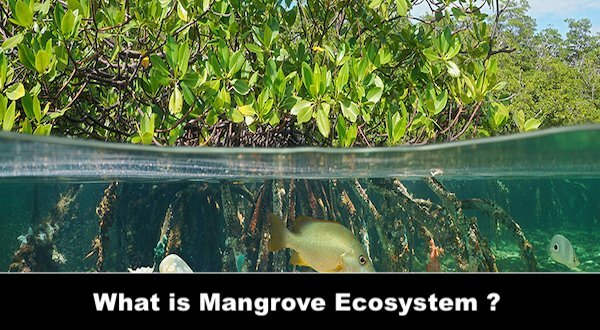 Mangroves Are Salt Tolerant Also Called Halophytes And Are Adapted To Life In Harsh Coastal Conditions. They Contain A Complex Salt Filtration System And Complex Root System To Cope With Salt Water Immersion And Wave Action. They Are Adapted To The Low Oxygen( Anoxic) Conditions Of Waterlogged Mud. They Produces Pneumatophores (Blind Roots) To Overcome Respiration Problem In The Anaerobic Soil Conditions. Mangroves Occur Worldwide In The Tropics And Subtropics .Mainly Between Latitudes 25’N And 25’S. They Require High Solar Radiation To Filter Saline Water Through Their Roots. This Explains Why Mangroves Are Confined To Only Tropical And Subtropical Coastal Waters. Mangroves Occur In A Variety Of Configurations. Some Species(E.G. Rhizophora) Send Arching Prop Roots Down Into The Water. While Other (e.g. A Vicennia) Send Vertical” Pneumatophores” Or Air Roots Up From The Mind. Adventitious Roots Which Emerged From The Main Trunk Of A Tree Above Ground Level Are Called Stilt Roots. Mangroves Exhibit Viviparid Mode Of Reproduction. I.E. Seeds Germinated In The Tree Itself (Before Falling To The Ground). This Is An Adaptive Mechanism To Overcome The Problem Of Germination In Saline Water.